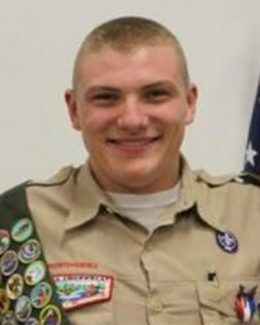 Tyler Kenneth Schlegel of Troop 121 in Bloomington recently earned the rank of Eagle Scout, the highest achievement in Boy Scouts, with a Court of Honor held on Oct. 22, 2017. He started his scouting journey as a Tiger Scout in first grade with Pack 123. Tyler participated in several adventure trips with his troop, including hiking the Appalachian Trail, Philmont Scout Ranch in northern New Mexico and Sea Base in Key West, Florida. To earn the rank of Eagle, a Scout must complete 21 merit badges and demonstrate leadership and community service by organizing and carrying out an Eagle Project. In May of this year, Tyler and his fellow scouts built a Gaga Ball Pit on the playground at Clear Creek Christian School. A senior at Bloomington High School South, Tyler is a member of the football and wrestling teams and National Honor Society. He volunteers at Sherwood Oaks Christian Church and is an active member of the 4-H Poultry Club and Junior Leaders. After graduation he plans to attend Purdue University. He is the son of Brad and Susan Schlegel.